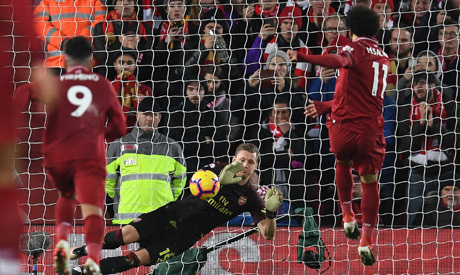 Mohamed Salah was on target again and Roberto Firmino struck a hat-trick as rampant Liverpool opened up a nine point lead at the top of the Premier League after crushing Arsenal 5-1 at Anfield on Saturday. It was the first time Juergen Klopp's side had trailed at home since December 30, 2017 but just three minutes later they were back on level terms. Mohamed Salah jinked into the box and went down under a challenge but the ball fell to Firmino who made no mistake with a cheeky 'no look' finish. Sadio Mane made it 3-1, converting a low Salah cross after a brilliant cross-field pass from Andy Robertson and then on the stroke of halftime Salah made it 4-1 from the spot after he had been brought down in the box, taking his tally to 13 goals as he sits joint top of the scoring charts. Liverpool are nine points clear of second-placed Tottenham Hotspur, who lost 3-1 at home to Wolverhampton Wanderers. Third-place Manchester City, who are ten behind Liverpool, can close the gap if they beat Southampton on Sunday.